The Apostille, Authentication and Legalization process is largely dependent on document type and whether the Apostille is applicable or if the full Authentication and Legalization process must be followed. 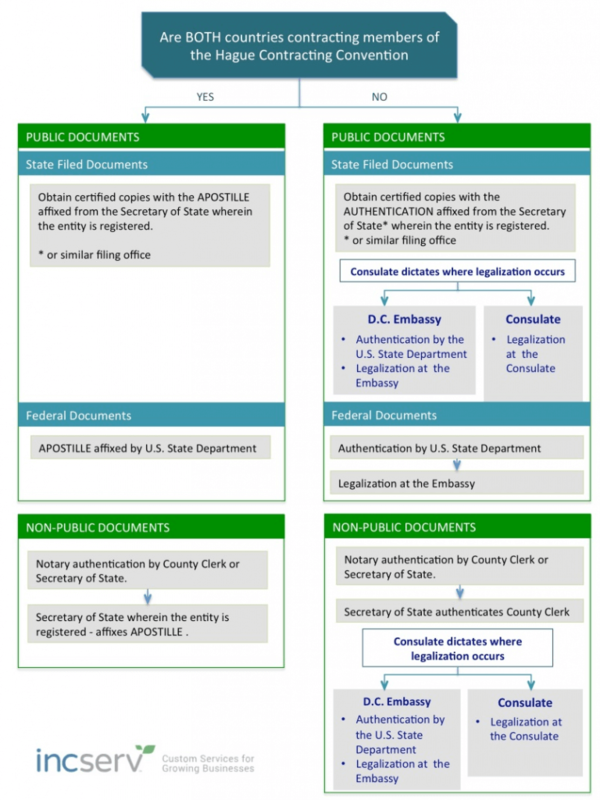 The above is a generalized workflow diagram that shows the relative simplicity of the APOSTILLE process when compared to the NON-APOSTILLE LEGALIZATION process, which introduces not only added complexity and time with the extra step of legalization, but also subjects documentation to the jurisdiction and review of the contracting countries embassy or consulate. You can do that by consulting the list of Countries and Territories that are Party to the Hague Convention Abolishing the Requirement of Legalization on the HCCH website. For an Apostille to be applicable BOTH contracting parties must be on the list. The Contracting list is distinct from the HCCH Member list in that not all HCCH members are contracting parties and not all contracting parties are members. As you can tell from the illustrated workflow diagram – the Apostille process is simpler than the Legalization and the Authentication process. Removing both the extra step associated with authentication as well as any ambiguity associated with variations in the procedures for each country consulates and/or embassies. It is important to remember that to a certain extent, consulates and embassies has the same authority as if they were a separate country. Legalization and Authentication procedures should be considered on a case-by-case basis and should never be assumed. The next post in this series dives into greater detail on tips to avoid rejection and expedite Apostille, Authentication and Legalization process. For more information or questions please contact a Incserv professional at info@incserv.com.